I just love living so close to our wetland preserves and sanctuaries. So many miracles of creation – every outing is a joy~! 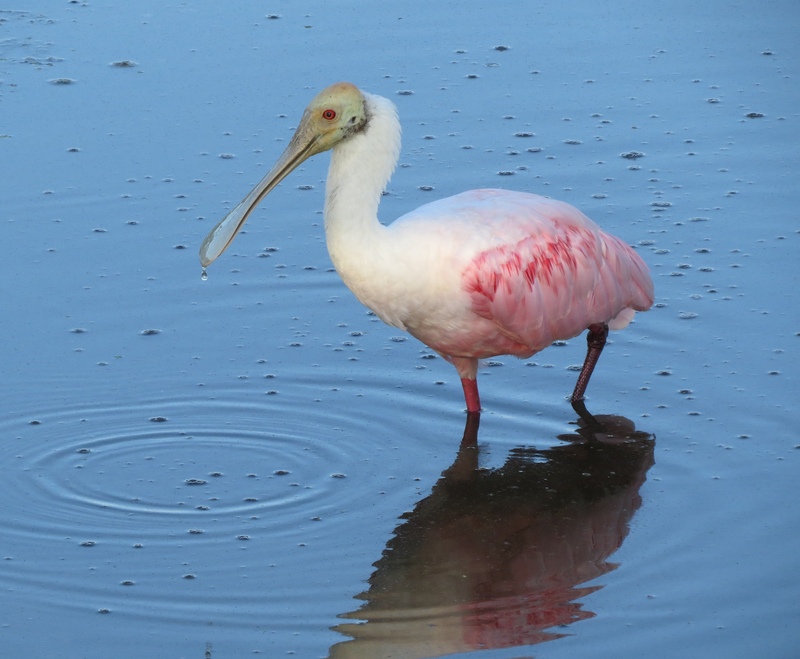 Roseate Spoonbill takes a stroll in the early evening. Ahhh…..I love the muck at this time of year. 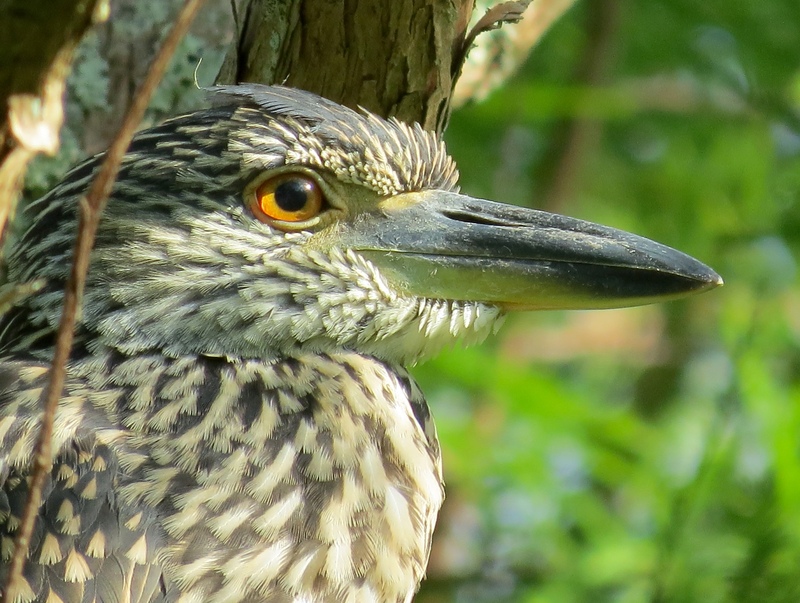 Juvenile Yellow-crowned Night Heron trying to hide in the Cypress trees. Snowy Egrets always look so graceful, don’t they? The sparkling eye of a Cormorant looks like a jewel in the evening light. 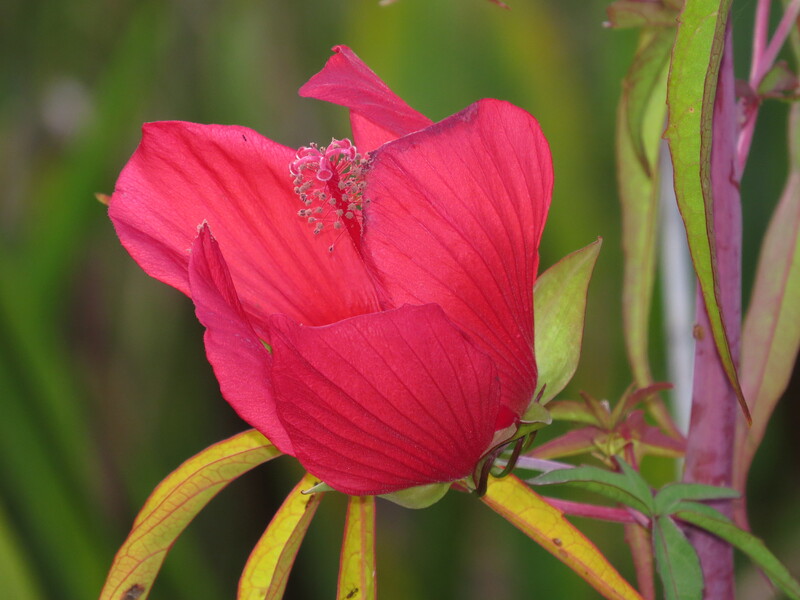 Splotches of red Swamp Hibiscus always stand out in the marshes. 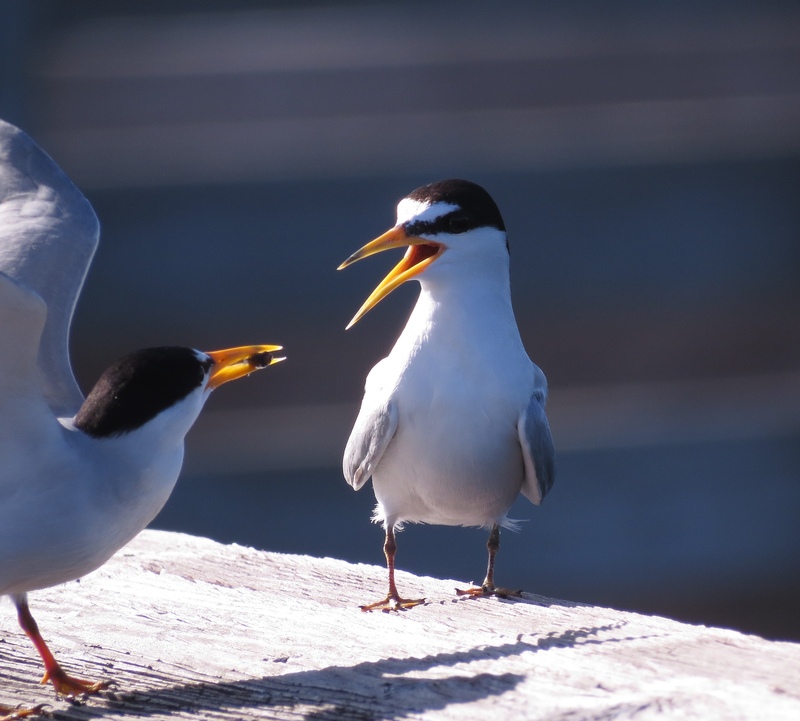 This entry was posted in Birds, Marsh/Wetlands and tagged Double-crested Cormorant, Least Tern, Pig Frog, Roseate Spoonbill, Snowy Egret, Yellow-crowned Night Heron. Bookmark the permalink. « Embarrassing moment for the GBH … oops! 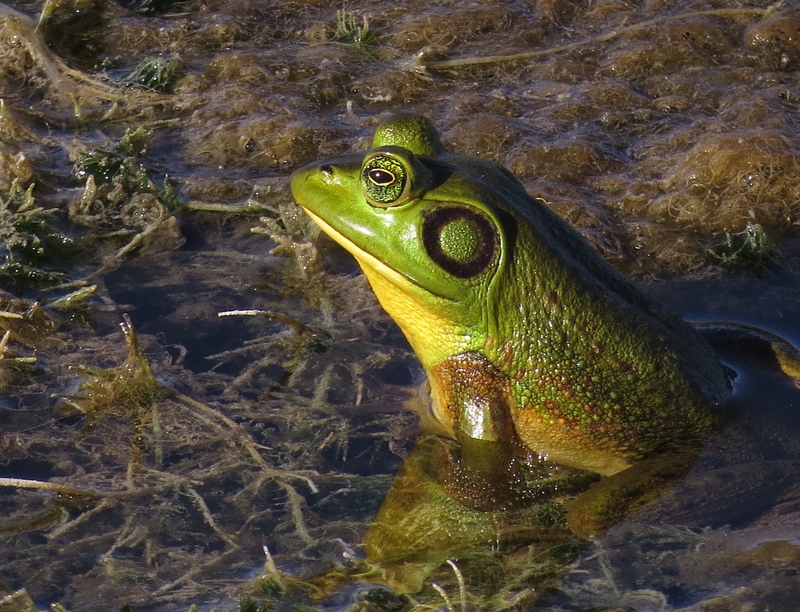 You have some beautiful images there, but I just love your regal looking frog. He needs a little crown. Haha, I love that idea Donna! Beautiful shots BJ, love the eye of the Cormorant! I love that Jewel-like turquoise eye, too, AB. 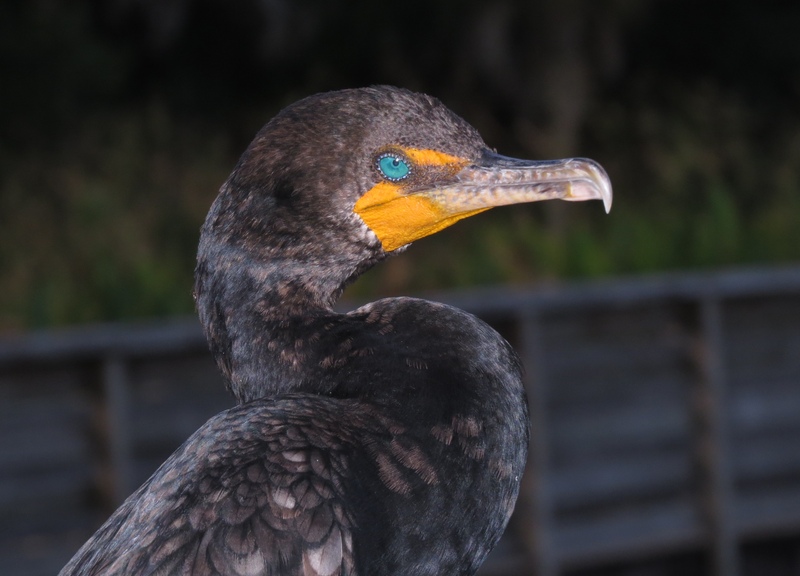 Interestingly, I just saw a very young cormorant yesterday sitting on the boardwalk, and his eyes were also a beautiful blue but softer and not as sparkly yet. That’s interesting, since many young birds of other species have dark eyes, and do not develop the adult eye colour till maturity. I was thinking the same thing, AB. I’ll have to post that picture of the little guy later this evening! Thank you, Amy! They look so soft against the sky, and their posture is always so elegant. Thanks, H.J., and thanks for making a visit! Very nice. I really enjoyed the “tour” of your wetland wonder world and having the opportunity to experience the biodiversity of a wetland ecosystem so different from my daily routine. I appreciate your visit and your comments, Nick. That’s one of the terrific things about blogging, isn’t it – to get to know a bit about a whole other part of the natural world from our fellow blogger’s points of view?! Lovely sightings and pictures. 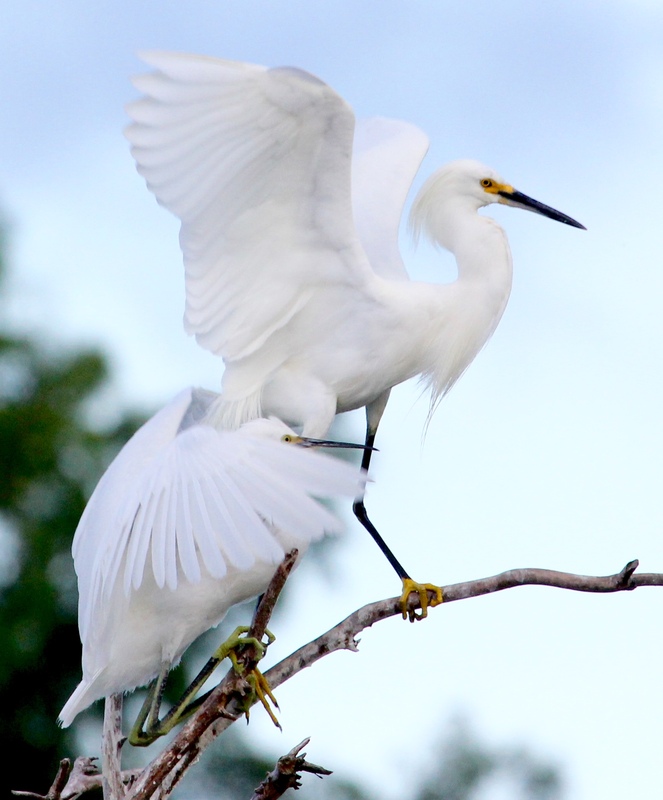 My favorite is the Snowy Egret… so elegant. I enjoy them, too, Lavanya….no matter what they are doing, they have such poise and grace~! What a collection of wonderful meetings! ‘Meetings’, yes! Each encounter with each creature is so special. I really dig that green frog and the eye of the night heron!! I do, too. Judy!! Glad you liked them, and thanks so much for your visit. Have a super day~!